People in grief need acceptance of their emotions for however long it takes for them to heal. Often the grieving person is afraid that others are ‘sick of them’ and will not ask for help. Try to telephone the grieving person on a regular basis with their permission, just to show you care. Allow them to grieve in their own way. Males and females sometimes have different types of grief responses. A typical male reaction can be to not talk about things because this will ‘only cause upset’. They need to feel in control to be the ‘protector’, ‘leader’ and ‘fixer’. Some women can use this method as well. A typical female reaction will be to talk over and over again about the deceased person and the death, often with tears and emotion. These different, yet normal, reactions can cause problems in relationships. 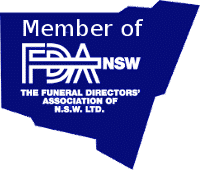 Children too from the age of 3-4 years are aware that someone is missing and need to be involved in the family with the funeral if they so choose. Older children will often outwardly copy adults in their grieving, for example, crying or not crying while inwardly having their own grief reactions as individuals. Grief affects us both emotionally and physically and our thought processes can alter for a period of time. Being vague and forgetful, having a fear of going crazy, too much sleeping or a lack of sleep are all normal behaviours. Some people say they see or hear the person who has died. Our bodily systems can also change; we might suffer from more infections, coughs, colds or high blood pressure. Make sure you keep in close contact with your family Doctor for professional help if you do experience continued emotional and/or physical problems. Grief responses are very individual. Each person will react in their own unique way. There are certain chemicals released by the grieving person, sometimes for months after the death, which are normal. These chemical changes may affect the way we think and feel. Often a birthday, Christmas and the 1st anniversary of the death are especially difficult times. It can take 2-5 years to re-adjust after the death of a loved one. Coping with the loss of a loved one and the resulting mix of emotions can be overwhelming. People need time to grieve as the loss of a loved evokes many emotions for a person as they work through the grieving process. 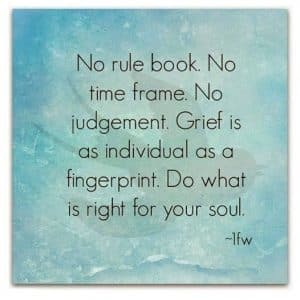 Grieving is a unique and individual experience. How you grieve depends on many factors, personality, coping style, previous loss experiences, faith, cultural, spirituality, gender, age, and the nature of the death. There is no time frame for grief, it comes and goes like waves and it may be weeks, months or even years before you begin to find some happiness in your day-to-day life. When we hear of a death we get a shock. When this happens our bodies protect us by releasing endorphins into our system to help us function as the enormity of the shock can be great. These endorphins only stay in our system for a few weeks as they gradually wear off. This timing often coincides with ones support network dropping away as those around return totheir normal lives. People often assume the grieving person is managing and should be “over it”. This is not so, you never get over the death of a loved one. What you learn to do is live with the loss and work towards finding a way of incorporating the life and death of your loved one into your ongoing life. Death ends a life but it doesn’t end a relationship. There are several aspects or stages to grief. The initial period is the Shock– the endorphins that are released actually numb you, this allows you to cope and function whilst you are busy organising the funeral, some people will talk about this time as being surreal whilst others report difficulty with even being able to carry out simple tasks. During this time you may have trouble believing that the loss actually happened, if someone you love has died you may expect them to walk through the door at the end of the day even though you know they are gone. As the shock starts to wear off the next stage begins – during this time people often describe physical or emotional reactions. These can include loss of appetite, chest pain, headache, and difficulty with sleeping, inability to concentrate, tiredness, irritability, anger and guilt. Sadness, and loneliness are common reactions. This is to be expected because if you have loved and someone has died … it is only natural – the way in which we grieve depends on the nature of the relationship, the day-to-day contact and the interdependence of the relationship. You may sometimes feel guilty about things you “should have” or “could have” done and often say to yourself “If only”. Some also feel relief, this often happens after a loved one has endured a long illness – on one level you are relieved they are not suffering any more but feel guilty for even expressing or thinking such a thought. People often feel angry, angry for no reason, angry at the world, angry at those around you, as often people feel the need to blame someone for this terrible event that has happened. If you feel you have caused or our responsible for someone’s death or are angry with a specific person it would be advisable to talk to a counsellor to work through your feelings. Grieving people need to talk, tell their story and have their feelings validated. Finally, you work towards Recovery. This stage is not the end of the pain, it is simply the time when you start to turn the corner, find the energy to function and are able to reconnect to the interesting and happy parts of your life. The hope is you will work towards finding meaning in the small things you once treasured. Be kind to yourself in your grief..